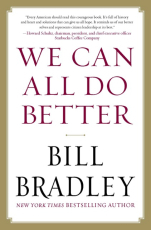 In We Can All Do Better, for the first time since the financial meltdown and since the worst of the intensifying political gridlock, Bradley offers his own concise, powerful, and highly personal review of the state of the nation. Bradley argues that government is not the problem. He criticizes the role of money in politics, explains how continuing on our existing foreign policy, electoral, and economic paths will mean a diminished future, and lays out exactly what needs to be done to reverse course. As this moving call to arms reminds us, we can all -- elected officials, private citizens, presidents -- do a better job of moving our country forward. Bradley is perhaps the best guide imaginable, with his firsthand knowledge of governments' inner-workings, the country's diversity, and the untapped potential of the American people.